Preheat oven to 200°C and arrange potatoes and onions on a lined baking tray. Drizzle both with a bit of oil, making sure the flesh of the potatoes are well coated. Bake for 15 minutes, then remove from oven, toss potatoes and add broccolini. Drizzle broccolini with a little oil and season. Bake for another 5 minutes, then remove from oven and add kale. Drizzle kale with a touch more oil and season. Bake for another 4 minutes then set aside. While vegetables are roasting, heat a large pan over medium heat and add chickpeas to a mixing bowl and toss with optional seasonings. Once hot, add 1 tbsp oil and chickpeas and sauté, stirring frequently. If they’re browning too quickly, turn down heat. If the opposite, increase heat. Try 10 minutes total at slightly over medium heat. Prepare sauce by adding all ingredients to a mixing bowl and whisking to combine. Add hot water until a pourable sauce is formed. Season and set aside. To serve: place half a cup of brown rice in each bowl. 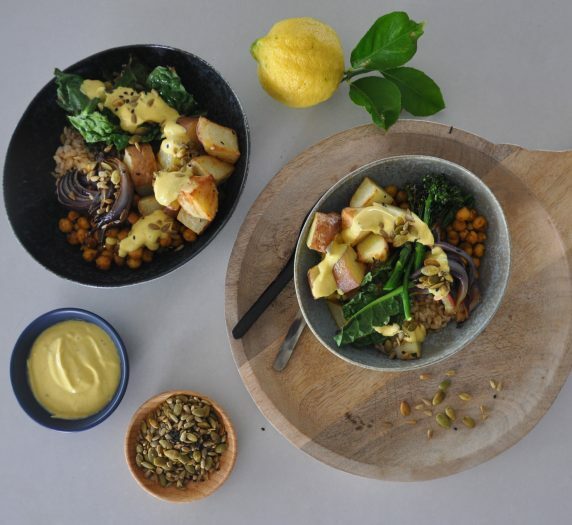 Divide vegetables between 4 serving bowls and top with chickpeas, sauce and seeds.